A few years ago I used to be so on top of cards. 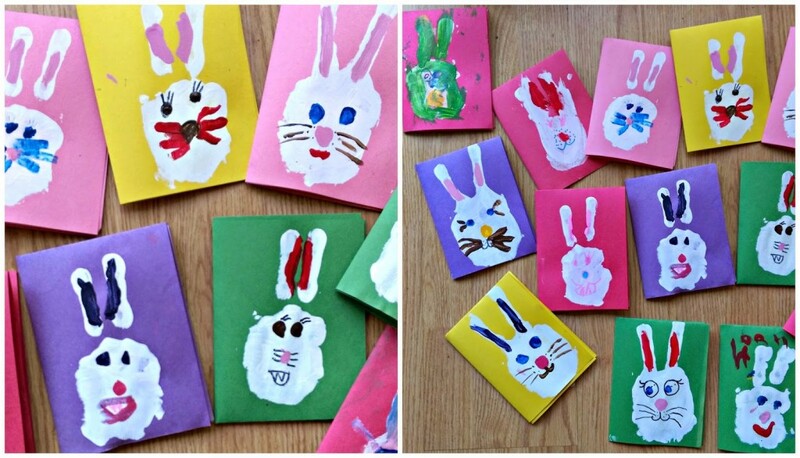 Making them, sending them; from Christmas to Easter to thank you cards – I did a pretty good job. Then somewhere along the way things have gotten busier and busier and I don’t take the time to make them like I used to with the kids, and that makes me sad. I don’t want to be so busy that I forget to teach the kids the importance of letting other’s know that you are thinking of them – and my kids are such little artists; they enjoy creating and sharing what they do. 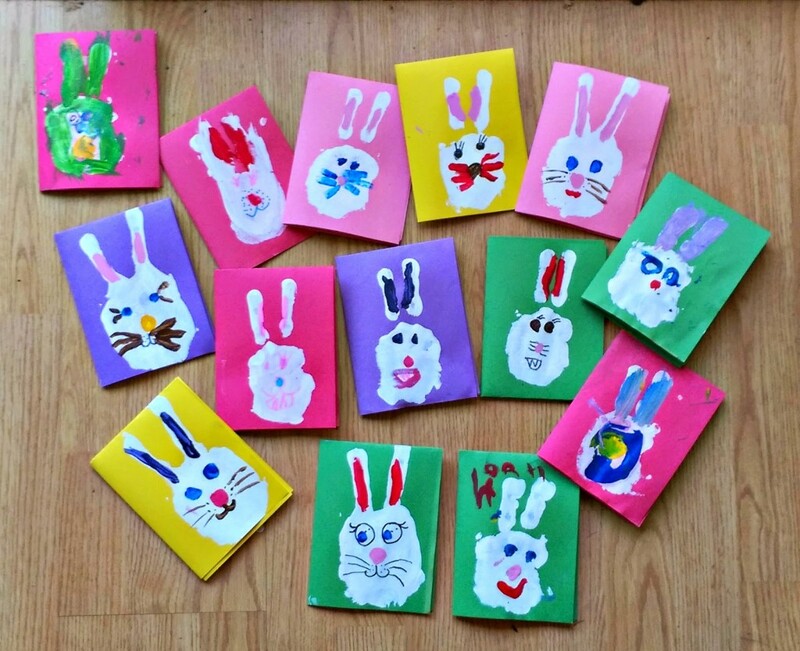 So, since it was spring break this week, and we were having a stay-cation, I helped them make their own Easter bunny cards to share with our family. They were so easy to make and it gave the kids the freedom to decorate them however they wanted, so it worked out perfectly. Fold the construction paper into fourths, creating your card. Then carefully paint your child’s palm, middle, and ring finger with white paint. Next, spread their two fingers apart, firmly place onto the construction paper. Repaint for each print until you have the desired number of cards. Let them dry completely. Then, allow your kids (or yourself!) 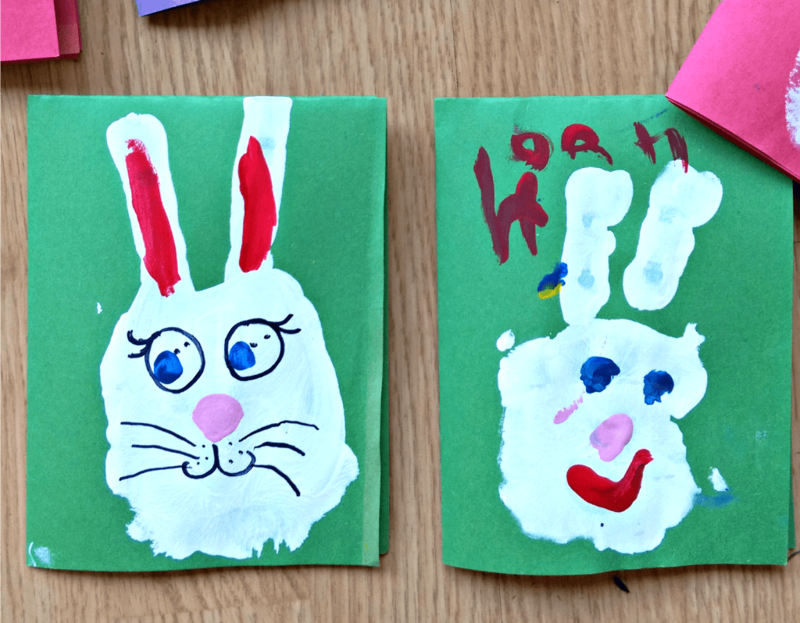 to create their own unique Easter bunnies! Now that we finally have the cards all finished I just have to physically put them into the mail! Guess I’d better get on that since Easter isn’t very far away!